Rockford Associates are Cyber Essentials Certified! 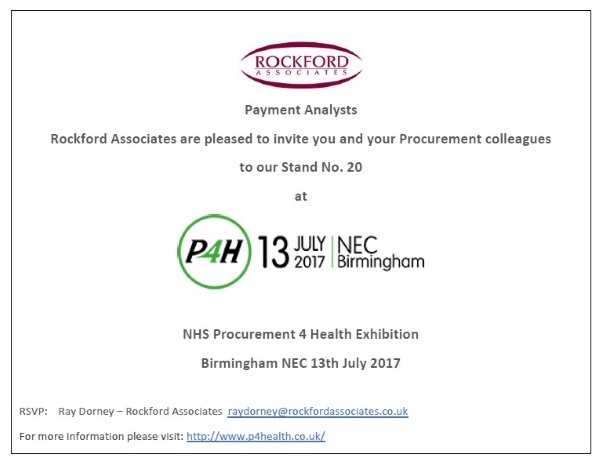 The Procurement Event for Health, is the UK's leading exhibition designed to promote and support the ongoing NHS efficiency objectives . One topic on the agenda and a question often asked by clients before an Accounts Payable Audit is, do suppliers always return overpayments?. The complexity of today’s customized goods and services contracts makes it extremely difficult for suppliers to bill accurately and even more difficult for companies to verify the accuracy of billing prior to payment. Over the last 15 years, ‘Accounts Payable’ processing has changed beyond recognition, as have the departments. There are very few large organisations which rely solely on manual invoice input into separate company ledgers. Companies have streamlined their ‘Accounts Payable’ departments so that, more often than not, multiple ledgers are processed at the same location. Such ‘Shared Service Centres’ run sophisticated accounting ledgers with built-in or purchased duplicate invoice checking.